I was incredibly anxious sending my daughter to daycare for the first time, but she (and her dad and I) had the best experience I could have hoped for with Mangala at First Steps. It’s so clear that Mangala loves these kids so much! 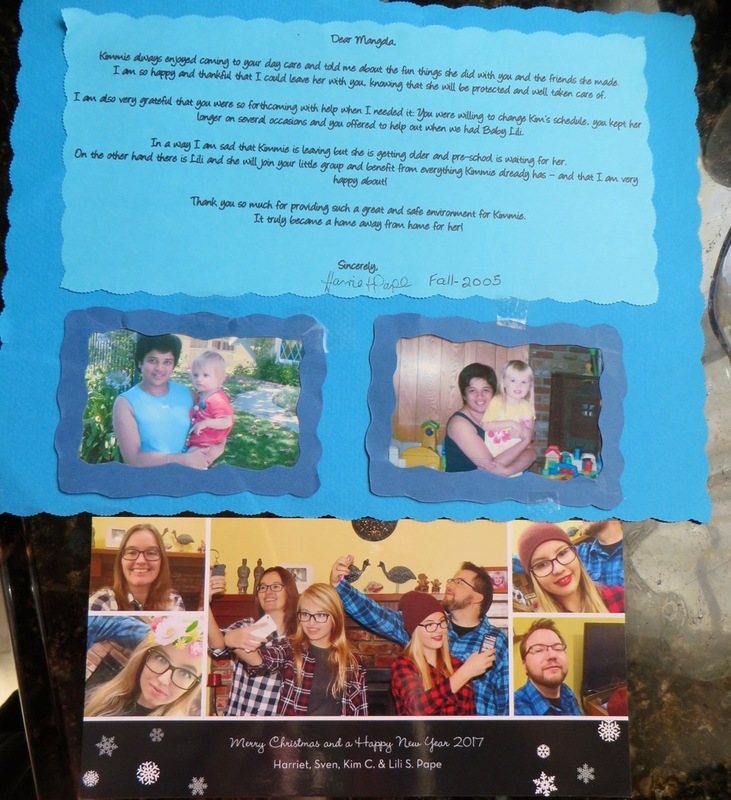 When we first met with her she showed me the wall of pictures and cards from kids who had been there years ago and were now graduating high school, and I knew from that it was a special place. Mangala would send me videos of the songs they were learning and always put my mind at ease when I was worried in those first couple of weeks. My daughter, who was there for a year starting just before she turned 2, learned the alphabet, counting, days of the week, countless songs, the Pledge of Allegiance, and so much more. And she got to spend so much time just playing with other kids, which is the most important thing at that age. Mangala was always very good at communicating with me or my husband about any issues our daughter was having, as well as things that came up (as they do in a home-based daycare) like her going out of town, having to be away for a couple of hours, etc. These things rarely came up (like twice in a year I think), but when they did Mangala was VERY careful to do everything by the book. She made sure to let us know if she was bringing an assistant (fingerprinted, background checked) in to cover when she was away. And the assistants she brought in were always people who she had known for a long time. My daughter loved all of them. Mangala was also very helpful to us when we embarked on potty training. By the time we left – just before my daughter turned 3 – she was pretty much fully potty trained aside from when she slept. This was a huge help for us, as you can imagine! My daughter made a nearly effortless transition to preschool, thanks to Mangala and all the terrific kids there. I’m so happy we made the decision to send her to First Steps and I continue to recommend it to my friends in the area. Most important of all is just the love and care she took with all of the kids. I got to witness that every day and it made me feel 100% confident in the choice we had made. If we had more kids they would all be going to Mangala’s! My daughter attended this daycare when she was ~7 months old. My husband and I researched nearly 50 day cares before we visited First Step – and we fell in love with it the moment we stepped in. The owner, Mangala Jayakody, is a delightful lady – she runs a clean, disciplined, loving and enriching center, where all the kids are happy and so smart! Mangala is quite obviously proud of her kids, and goes above and beyond to take outstanding care of them and teach them. Our daughter absolutely loved the day care, Ms. Mangala, her helper and all the other kids.She eagerly looked forward to going every day, and dove straight into Mangala’s arms when we dropped her off. She was always well taken care of and did really well. Since this was such a great fit, we worked hard to make arrangements to get day care to work – we even hired a morning and evening nanny to help with drops offs and pick-ups. Ultimately, we had to take our daughter out for personal reasons but we still visit and our daughter still is delighted when she seems Ms. Mangala and the other kids! 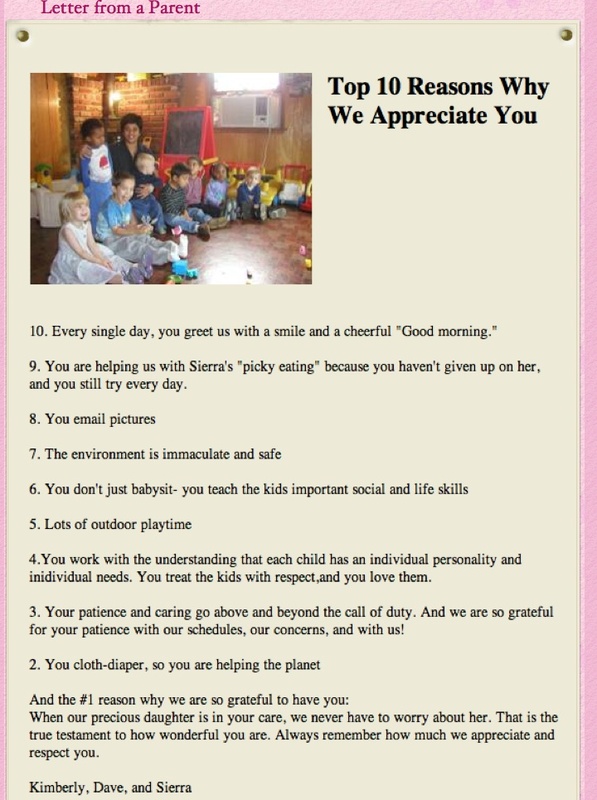 We hope to bring her back to this fantastic day care in a few months. We cannot recommend Mangala and First Step daycare enough! My son has been going to First Steps Family Day Care (FSFDC) since he was 6 months old. My son was 2 years old when we left FSFDC due to relocating back to our hometown. Being a first time mother, and a returning working mom, I was quite apprehensive to leave my son under the care of non-family members. However, the moment I met Mangala Jayakody (owner and primary care-taker at FSFDC), I immediately felt at ease that we found the right person for my son. Mangala has a lovely demeanor and is someone I would consider as an extended family member here in LA. These were important attributes for me, as I wanted to make sure that my son was loved and cared for in the daycare environment, especially living in LA, which is our home-away-from-home, away from our family. A true testament to the amount of love and attention that my son got from Mangala and Gnanna (her right-hand lady) was the amount of cuddles that my son would give them both at the start and the end of the day. If hugs and kisses were the currency of children, then Mangala and Gnanna are truly rich women. They are adored by all the kids at FSFDC. I sincerely thank Mangala and Gnanna for showing my son the love and affection through all the years. He is the cuddly and well behaved little boy that he is today because of these lovely ladies. Since leaving FSFDC, we have really missed the mornings that my son and I would knock on their door and be greeted with Mangala’s big smile and cheery “Good morning, Mr Julian!” We were truly blessed to have Mangala and Gnanna as my son’s Sri-Lankan mamas. When my wife and I decided to move to the valley we scoured yelp reviews, much like you are now, for a great day care. Let me save you the time- look no further than First Steps. Mangala (who own and runs the day care) is perfect. Truly. She’s kind, gracious, professional and runs a day care simply because she loves kids. She has a HUGE, secured yard with tons of toys and the day care is in a safe, family-friendly neighborhood. Mangala cares and you can see it in all of the kid’s interaction with her and with each other. She is invested in her children and takes the time to teach each one individually. You just can’t ask for more. Our daughter has been to other day cares and it doesn’t get better than this. If there is availability, I sincerely recommend sending your child to First Steps- firststepsdc.com! Exceptional daycare! My son was here from when he was 12 mos til he was 26 mos. He loved it. The only reason we left was because my work situation changed. This place is a working mom’s dream. It is squeaky clean. Mangala, the owner, is kind, loving, gentle, patient and firm with the kids. My son developed so many good habits from her. He always puts his things away. He even puts himself in time out! He never wanted to go home! It is incredibly difficult to find a daycare for your child. Trust me, my wife and I looked at a ton of them before we visited Mangala at First Steps. Our daughter took to it immediately. So much so that we were worried a little about having to tell her she would be starting pre k this past fall and she wouldn’t be going to First Steps anymore. The transition was seamless and it was due to Mangala spending time with her and teaching her all of the basics you learn in pre k. Not only did she learn her numbers, letters, colors, shapes etc., Mangala and her staff also were instrumental in helping us with potty training. And that’s a tough job. Our son goes there now and he loves it just as much as our daughter. A million thanks to Mangala and her staff for creating a safe, fun and educational environment for our kids to learn and play. Five stars and highly recommended. We kept our daughter at First Steps (instead of starting preschool) until she was 4.5, because she loved it there so much. Because she was older, Mangala offered to work with her on letters, numbers, writing, etc. She just started Pre K in the Fall and at our first parent teacher conference, the teacher told us that our daughter has already mastered every section of the proficiency checklist for Pre K.
The teacher said that it’s obvious we really worked with her before Pre K, but the truth is that Mangala taught her all of those things at First Steps. She also taught her how to work well with others and how to be a good learner. Oh, and Mangala and Gnanna were a huge help with potty-training. I’m certain my daughter’s social and academic success in school is in large part because of her years with Mangala and I’m so grateful. My son has been with Mangala for two years now and he loves it as much as my daughter. He knows his ABCs, and I was shocked when he correctly identified numbers the other day. These are not things I’ve taught him. It’s so hard to find a place to leave your kids without a moment’s hesitation. My husband and I have felt so so lucky to have Mangala and Gnanna. Our kids have been well loved, and well fed, and well cared for at First Steps. I’ve highly recommended First Steps to my friends. First of all, this daycare center is top notch! My daughter was cared for by the nurturing and caring staff at First Steps from age 2 until she was 4. As working parents, the staff provided us with the peace of mind knowing that our daughter was well cared for in a fun, safe, and clean environment! Not once did my daughter cry about going to “school.” She looked forward to seeing the staff, the kids, and playing outside in the large spacious play area. Mangala greeted us every morning with a beautiful smile and a caring hello, with a tone that beamed excitement for the new day. The owner is phenomenal – always available to speak with and she genuinely cares about the children as if they are her own. She has years of experience and it shows! She is excellent at explaining things to children with embedded life lessons! It is a daycare center but the children are learning about colors, animals, the alphabet, songs, sharing, cleaning up, and assistance with potty training. The children are fed nutritious meals with vegetables and healthy snacks – my daughter still misses the food! I can’t thank you enough for everything you provided our family. Mangala and Yana you are THE BEST!!! My daughter is now in preschool but she continues to remember the memories created at First Steps! If you are looking for a home-like environment that will take good care of your little one, this is it! They always have a waitlist so if you want to get your child in or will need childcare in the near future, I recommend you get on the list ASAP!! I have been meaning to write this glowing review for months – Mangala is the most wonderful daycare provider I could have imagined. I was SO nervous sending my 5.5 month old to daycare for the first time, but the second I toured Mangala’s home I knew my daughter would be happy and well taken care of. We had to switch daycares a couple of months ago due my changes at my husband’s job, and we miss Mangala so much! If you are lucky enough to get a spot at this daycare, jump at it! Mangala is just the most warm and caring person and I always felt relaxed knowing my baby was in her care. My daughter would do a little happy dance as we walked up to the door every morning and would be in a great mood every day at pick up. We miss you, Mangala! 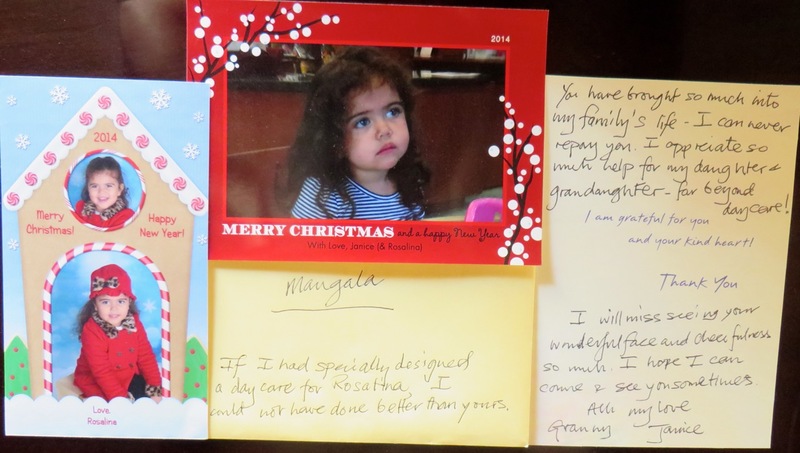 Love, Maureen, Keith and little Rose. Not your average daycare…an awesome one! Mangala and her helpers are great. Just like family, my boys still call her and her helpers auntie. It’s been several years since they’ve gone there but we still stop in once in a while. Why? because my boys always ask to see their Auntie Mangala and when we do it’s like my boys were there yesterday. When my boys were going there, Mangala and her helpers would always provide a quick insight of their day in regards to what they ate, schoolwork and any funny/loving moments with the children. In addition, Mangala helped potty train my sons which I really appreciate because not a lot of daycares would do that. As parents, we know potty training can be hard when there is no consistency, but with Mangala and the helpers, consistency was never lacking. She has done such a great job with my boys. When they first started school they were advanced. Thanks to Mangala and her helpers in continuing what we were doing at home in the daycare. My son’s kindergarten teacher was impressed at how nice his penmanship was at such a young age and able to spell his own name on the first day of school. In addition to knowing his alphabets and their sounds. I can honestly say Mangala and her helpers are not your average caretakers and care for these children because it’s their job, it’s because that’s what they love to do and are excellent. Such honest professionals in my book and the next best thing to family to care for my children. What more can you ask for? Just like family we will continue to keep them close to our hearts and will continue to visit them. This daycare is definitely on my list if I were to ever have another child. Overall you will not regret having your child here. My son used to have nightmares from his previous daycare provider. He was nervous at first when he started going here but quickly warmed up and loved it. He always looked forward to going and most times, he would rush in without saying bye. The kids have a great time, her prices are very reasonable and she will work with you if needed. I HIGHLY recommend sending your children there. My siblings and I used to go here when I was younger and really enjoyed it! We were treated like family and I still have many fond memories of this place, even after all these years! Thank you so much! I’d recommend it to anyone willing to leave their children at a safe, fun, and loving daycare. My son has been going to this day care for the past 8 months and he loves it. We are so glad that we found this day care run by Mangala Jayakody and that she had space for him. In the morning, Mangala always opens the door with a big smile and Good Morning and my son jumps into her arms. He quickly closes the door so that he can go inside and play. He doesn’t even give us a chance to say bye :=) In the evening, it’s so hard to get him to go home. We are very lucky to have found Mangala’s daycare. She is flexible, professional and a very loving person. We feel good to leave him there knowing that he is being taken good care of. Mangala also sends us photos and videos of him at day care, and we can’t wait to watch them…they’re so fun. It gives us a chance to see how he interacts with other kids at day care. My son loves Mangala’s helper, Gnanna. Gnanna takes such a good care of my son and he adores her. I HIGHLY recommend this day care. My daughter started out with her “aunties” when she was just 3 months old and just recently graduated on to preschool. I have nothing but good things to say about our experience at First Steps. I’m a working first time mom with all the pressures and demands that entails and knowing that my daughter was with the next best thing to family meant that I could focus on my work and know that she is safe and loved. Plus she learned so much while she was there, including numbers, alphabet, colors, songs and manners. Everyone who meets my daughter tells me how impressed they are that she says please and thank you and I can say that she learned that here! Thank you so much for all you’ve done for my family Mangala and Gnana! First steps, Mangala and her helper Nana are the best! My son started with Auntie almost a year ago and is excited to go everyday. Mangala provides so much caring and kindness along with a great routine and structure for the children…. Along with manners, learning to share, socialize, letters, numbers etc. My son is thriving. I couldn’t be happier. Such a great place! Looking for a daycare to begin with is hard. To be able to trust someone with your child is even more difficult but Mangala has totally put our minds at ease. She is loving as well as her assistant. Our son is in a safe, structured, educational and clean environment. Me and my fiancee are so happy we found her and have her to take care of our son. Our son loves her and looks forward to going. My wife and I love this place. This is our son’s first daycare and he loves it. Not only he trippled his vocabulary he is also eating different types of food, and teaches him wonderful songs, habits and manners. The owner is a great and her helpers are wonderful with the kids. She has a great and clean place and I feel safe taking dropping off my son. My son never wants to go home and even wants me to drop him off during the weekend. Send your kids to Mangala! I sent both of my daughters to First Steps until they entered preschool. I was so happy with Mangala and her team! Mangala has so much energy, and she truly loves her kids. The daily routine is perfect for little ones: they have outdoor playtime 2 or 3 times a day, snack times, lunch, rest time, singing, and indoor playtime. Mangala teaches them songs, letters, colors, names of objects, etc. She also teaches them manners, sharing, and friendship skills. It is a sparkling clean, safe environment. The kids have so much fun; mine used to cry when I came to pick them up. They didn’t want to leave! A true gem! After searching for weeks for a Daycare for my son, I immediately knew this was it. He was there with First Steps until we moved out of state, and we’re still looking for a Daycare like First Steps. Clean, caring, and safe. Truly the best in town. We found this daycare eight years ago when my first son was three months old – he stayed here for more than three years. Now his little brother has been here since HE was three months old and I had made sure to call early and reserve a spot – I would not have settled for anything else. Family setting with a loving atmosphere, home-cooked meals and lots of play time and solid routines. This became a second home for both our sons and I would highly recommend it to anyone who wants peace of mind that their child is in good hands. I truly love this day care center. Everyone is warm and caring and when your child doesn’t want to leave when you pick them up that’s a great sign that they love it there! My daughter received a great start in this center. They are always full so if you get a spot, you are very lucky!! in time-out when he misbehaves at home! I would like to recommend First steps day care family center. Both of my kids attended this place fore more than 2 years, words cannot express my enormous gratitude and appreciation with their great work with my kids.The total care attention, patience and love invested with the kids are absolutely priceless. With both of my kids under the care of Mrs. Mangala my heart was at peace. Other than the daily care for the kids, other important values such as social skills and well manors were also invested with the kids. I would like to thank from the bottom of my heart to Mrs. Mangala who operate this day care center for many years, you are a special person in my eyes and the precious work that you had done with my kids are priceless. This is the right place for any working mother out there who is looking for the right daycare to put her kids in. First Steps is the best!